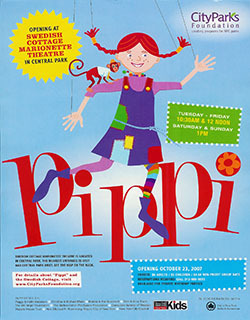 Swedish Cottage Marionette Theatre Welcomes Pippi! "Pippi" is a fresh retelling of the classic Pippi Longstocking tales by Astrid Lindgren, adapted for the stage by award winning playwright Zakiyyah Alexander. The production features nearly two dozen all new, hand-made marionettes crafted by puppeteers from the Swedish Cottage under the supervision and expertise of master builder Addis Williams. In addition to the brilliant artistry of the production, kids and families will enjoy the incredible adventures of quick-witted and super-strong Pippi as she overcomes bullies and burglars, all while fending off social conventions that threaten to prevent her friends from being creative. Hans visited the Swedish Cottage at the premiere on the 10th of November to see the new Pippi show. Here he is together with Swedish puppeteer Cinna Vesterberg (left) and Bruce Cannon, the artistic director (right). Click here to see an episode of NYC TV about the Swedish Cottage Marionette Theater in Central Park.